Our team of dedicated tow trucks and staff provide light duty vehicle towing. We are equipped with all of the necessary equipment to tow various types of motorcycles and cars. Our experienced tow truck team handles the tasks swiftly and will make sure that the vehicle will be damage-free while it is being moved. Just give us a call at any time of day, any day of the week as we work round-the-clock. We will arrive at your location as soon as possible to assist and solve your roadside issues. No matter when your vehicle breaks down, we can safely tow your vehicle. Our services are available 24/7, your vehicle will be treated with professional care. 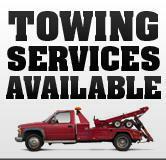 We provide quick and affordable medium duty towing services. Our fleet of tow trucks and flatbeds are available in retrieval and recovery of medium-sized trucks, utility trucks, RVs, vans, motorhomes and more. We employ the latest technology and best operating practices to ensure that we perform safe and smooth recovery for your vehicle. Whether your RV has broken down or your van is stuck in a ditch, we have skills and expertise necessary to move your vehicle out of the spot and safely tow it back with minimum or no damage whenever possible. Our heavy duty towing service has the efficiency, strength, and reliability you need. The size and strength of our heavy-duty tow trucks provide an opportunity for us to offer affordable and fast towing. Combined with our experience and technique, we can tow vehicles such as buses, semi-trucks, motorhomes, heavy equipment and more. Wheel lift towing is one common method of towing. Depending on the situation, it can be advantageous to use such method. Wheel lift towing is more innovative compared to hook and chain towing. The wheel lift tow trucks use metal yokes to lift up the towed vehicle by its tires, whereas the traditional hook and chain tow trucks use chains to wrap around the axles of the towed vehicles. The traditional method can potentially damage the towed vehicles. Wheel lift towing is highly maneuverable, which allow vehicles to move through tight spots. As one of the easiest methods of towing, wheel lift towing can provide results with fewer efforts, at the same time not doing any damage to the towed vehicles. Flatbed Towing is optimal for vehicles which are already damaged or fragile. Other towing techniques may cause further damage if not done well on worn down vehicles. With flatbed towing, the car will not experience any tear or wear during its trip. The reason is that the four wheels are off the ground, the engine parts are not moving and it is safe from engine ignition. Flatbed towing is one popular and safe method of towing. We can tow vehicles such as motorcycles, cars, luxury cars and vintage vehicles, medium-sized trucks and more with this method.